If you’ve been reading my posts for a while, you know I love my stand up desk. It’s helped me get through a painful back . . .
Stay focused . . .
Be more productive . . .
And keep the ever-creeping pounds off . . .
I’ve examined all the in’s and out’s of standing more during the day in my free guide, The Simplest, Most Important Move For Your Business, Your Waistline And Your Life. If you haven’t read it yet, you should go download a copy. It’s free and inspirational, giving you lots of good reasons for standing more. And it shows you secrets for how to fit it in and get the most out of standing while working. However, standing up while typing is a little too tame for some folks. Of course, you don’t have to stand still at your desk. You can go up on your toes or wiggle your hips or do a few squats, like I do throughout the day. But perhaps that’s not enough. Perhaps you want to take standing while working to another level . . . If that’s the case, here are three additional beyond stand up desk options you might want to consider. If you’ve been mulling over getting a stand up desk, you’re probably familiar with this next step up – or many steps forward – a treadmill desk. This desk sprung out of research conducted at the Mayo Clinic. Researchers discovered that fidgety people burned more calories and were trimmer than people who didn’t fidget. Even when compared to people who put an hour in at the gym. As they looked more closely, they found the average person could burn more calories by moving moderately throughout the day than you could burn in a good hour-long workout. Non-exercise thermogenic activity (NEAT) is the term they developed to elevate fidgeting from an annoying habit to the status of exemplary behavior. Excited by this discovery, the lead researcher, Dr. James Levine, designed a desk that could fit on a treadmill. He found by setting the speed at level 1, he could comfortably walk and write at the same time. His discovery caught on. Now you can buy treadmill desk attachments. And treadmills specially designed for walking slowly while typing. This image is from an article on the “growing anti-sitting movement” according to the Boston Globe. Dr. Sherry Pogoto pictured here says she’s planning to get a second trekdesk for her other office. She likes it that much! While I hope to some day modify my old running treadmill to accommodate a desk now and then, I’ve heard a few rationales for the treadmills specially designed for NEAT. They’re easy to set up. And the motor is made to survive long days of constant use at a low speed. 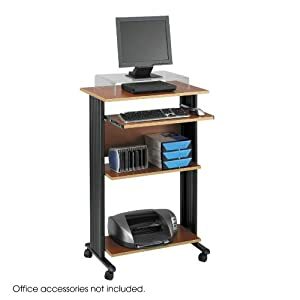 Lifespan treadmill desk with all the fixings – treadmill included. The Trek Desk designed to work with most treadmills. A couple years ago I wrote that my bike is perhaps one of my favorite pieces of office equipment. My bike has also served me well in helping me break out of my workday and return to family and home life. When the weather’s bad, I’ve got an easy bike stand that helps me modify my bike into a stationary bike. I’ve used this for my second pregnancy and through many a wintry month. However, I can’t use my bike to do what this bike does . . . This “bike” combines NEAT with biking so you can write while you bike. If you’re more of a biker than a walker, this may be the solution for you. Get a Fit Desk bike-while-you-work desk. If you’re intrigued – but still a little doubtful – find out how even a Geek Mom used this with little trouble. Geek Mom blogger, Kay Moore, placed this review on Wired. Moore was pleasantly surprised at how easy it was to assemble and use.Amazon link. A treadmill desk can get clunky – you need space to store it and use it. A bike desk poses the same problems. Even the simpler stand up desk ties you down. And no, you can’t take it with you . . . If you want to walk while working without restriction, there’s another option . 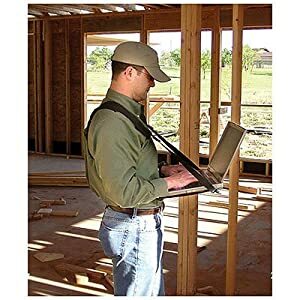 . .
It’s a special harness so you an hold your laptop in front of you while you walk or stand anywhere! And some of the reviewers on Amazon says it’s not as sturdy as they’d like. However, if you’re looking for an inexpensive solution you can take with you anywhere, this may be your best bet. One reviewer loves using it while standing on the bus on the way to work each day. You can get a laptop harness right here. I hope this got you thinking about all the ways you can pry yourself off of your chair and get moving while working. In fact – scratch that – I hope it did more than just pique your curiosity . . . I hope it got you excited to move more and mix it into you workday. I promise, you’ll feel better, work better and live better in the long run. That being said, it is a change that can take a little bit out of you. I’ve heard plenty of stories of achy feet, knees, and backs. I’ve certainly found myself enjoying the occasional afternoon I spend sitting outside on a chair while working. After a day of standing, sitting becomes a simple pleasure – almost a luxury. So I leave you with this final cautionary tip . . .
Take it step by step. A little bit at a time. Your body will love the change in the long run. But it will take some time to develop new muscles and new working skills. Don’t shoot yourself in the (newly walking) foot by getting all gung ho and then hating your change. Keep your regular desk and chair nearby and then start off with twenty minute spurts. Work up to an hour . . . and then a couple in a row. Eventually you’ll be able to go for most of the day with a few sit down breaks in between. Have you tried one of these? Or did this inspire you to do so? Please share your thoughts below.